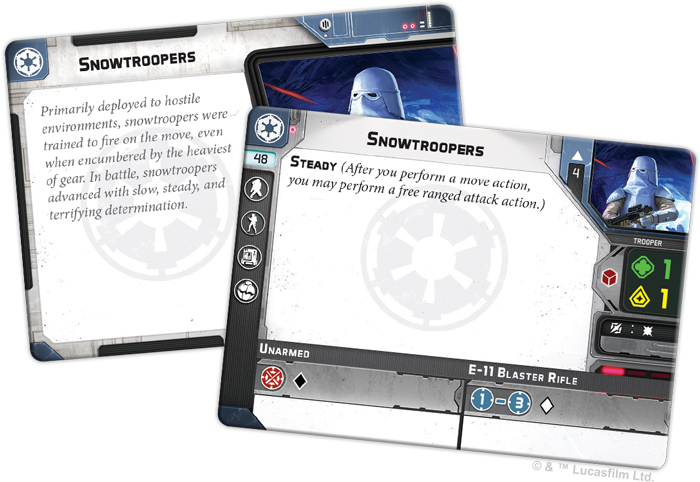 Order your own copy of the Snowtroopers Unit Expansion at your local retailer or online through our website today! The reach of the Empire is vast. There is no distance great enough—or planet remote enough—to prevent the Empire from rooting out those who would challenge its ultimate authority in the galaxy. When these Rebels are found on planets with adverse conditions, the snowtroopers stand ready to impose the Emperor’s will. Soon, you’ll be able to add squads of Snowtroopers to your Imperial armies in Star Wars™: Legion with the Snowtroopers Unit Expansion! 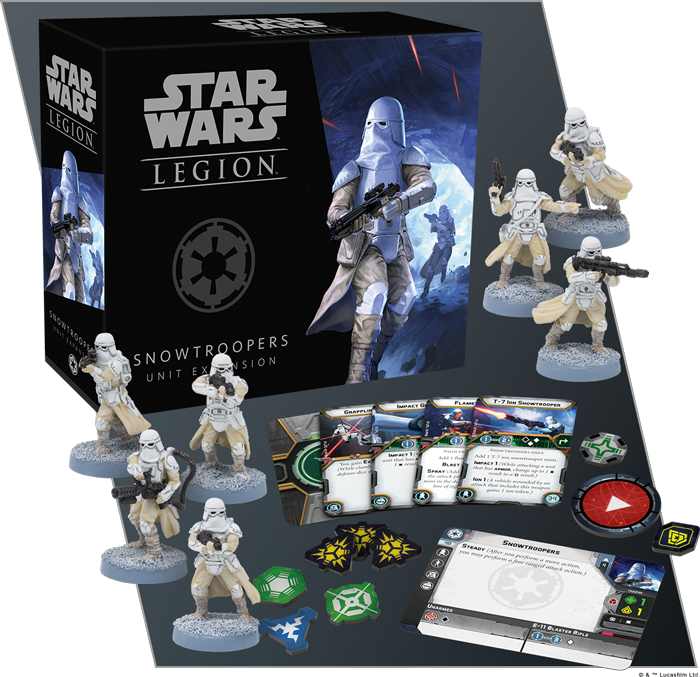 Inside the Snowtroopers Unit Expansion, you’ll find seven unpainted, easily assembled miniatures, along with the cards and tokens that you need to add a squad of Snowtroopers to your army. With their own set of heavy weapons and potential upgrades, the Snowtroopers make another terrifying addition to your Imperial army, and today, we'll take a closer look at exactly what you'll find inside this expansion! Employing specialized gear and trained in ruthless assault tactics, snowtroopers move slowly but deliberately, their expressionless helmets and relentless blaster fire intimidating any enemy in their path. These troops give Imperial commanders another option when selecting the corps units that will comprise the rank and file of their armies. Still, both Snowtroopers and traditional Stormtroopers have different abilities to offer. At a cost of 48 points, a basic unit of four Snowtroopers is slightly more expensive than a group of Stormtroopers, but they remain cheap enough to add several to your army. Likewise, both units bring different abilities and strategic options to the table. 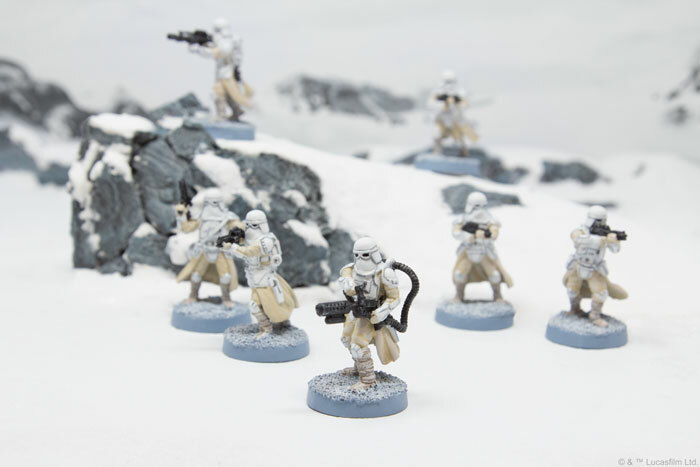 Like their Stormtrooper brethren, Snowtroopers use the E-11 Blaster Rifle commonly found among Imperial infantry, with each miniature in the unit contributing a single white attack die. 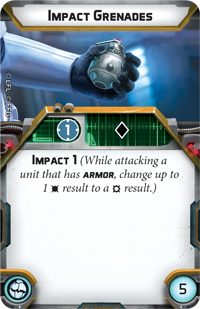 Snowtroopers also feature the same sturdy armor as Stormtroopers, allowing them to roll red defense dice when defending. There are also notable differences, however. Where Stormtroopers focus on improving their accuracy through their Precise 1 ability, Snowtroopers are trained to fire on the move, pressing forward no matter what. Their Steady ability reflects this, allowing them to perform a free ranged attack after moving. So, despite their slower speed, Snowtroopers can aim, move, and shoot in rapid succession, applying constant pressure as they deliberately move across the battlefield and lay down suppressive fire. The new upgrade options provided by the Snowtroopers Unit Expansion also help Snowtroopers distinguish themselves from other Imperial soliders. They feature the same heavy weapon, personnel, grenades, and gear slots as Stormtroopers, but they take these customization options in new directions. 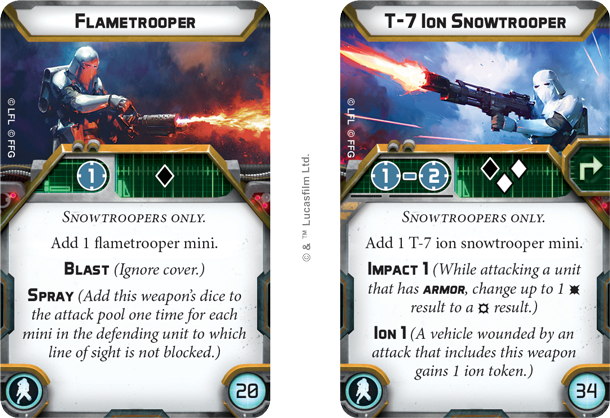 You can always add another Snowtrooper mini to your unit, of course, for added firepower and durability, but Snowtroopers can be further customized and given specialized roles in battle. The Snowtroopers Unit Expansion gives you access to two new heavy weapons specialists that can give this unit an extra punch. The Flametrooper, for example, is perfect for dealing with your opponent’s troopers, provided you can get within Range 1 to make your attack. Through its Spray ability, this specialist adds one black die to their pool for each mini in the defending unit. 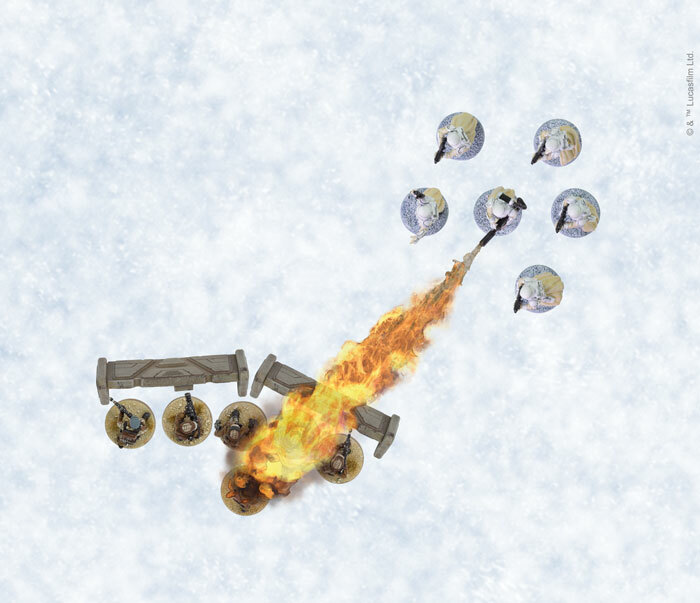 On top of that, Flametrooper ignores cover thanks to its Blast ability, potentially setting up devastating attacks against units your Snowtroopers catch off-guard. 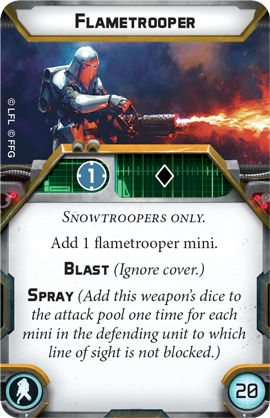 With its Blast and Spray abilities, the Flametrooper ignores cover and adds dice to its pool for every mini in the defending unit that it can see! Where a Flametrooper gives you a potent option for dealing with enemy personnel, the T-7 Ion Trooper provides a solution for enemy vehicles. This trooper has a chance to crack through the thickest armor with its Impact 1 keyword. If it does, Ion 1 ensures that any vehicle hit by this attack takes an ion token, robbing it of actions later. This vehicle-stopping power comes at a cost, however, as this upgrade card must be exhausted when used, forcing you to take the recover action to fire it again. Finally, the snowtrooper’s grenades and gear upgrade slots make them even more customizable. 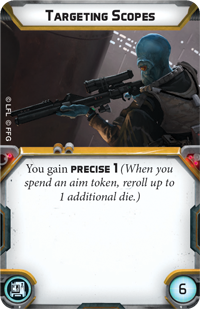 The Targeting Scopes found in the Core Set pair nicely with Snowtroopers’ Steady ability to make them even deadlier when they use an action to aim. 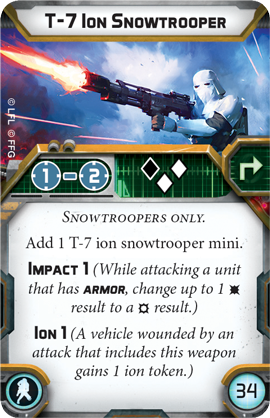 On the other hand, you can always supply your troops with the Impact Grenades found in the Snowtroopers Unit Expansion if you’re looking for a cheaper alternative to dealing with vehicles than a T-7 Ion Trooper. Your units of Snowtroopers stand ready to battle Rebel scum wherever it is found. Bring the weight of the Imperial legions to bear against all those who would defy the Emperor! 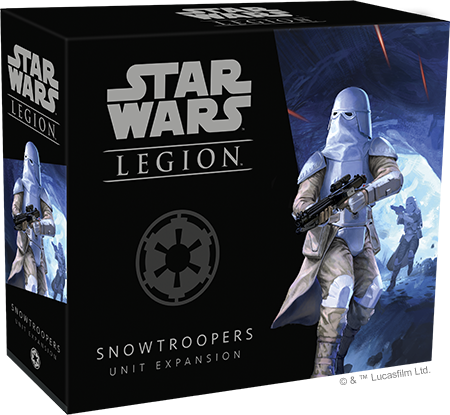 You can pre-order the Snowtroopers Unit Expansion (SWL11) and other Unit Expansions at your local retailer or online through our webstore today!